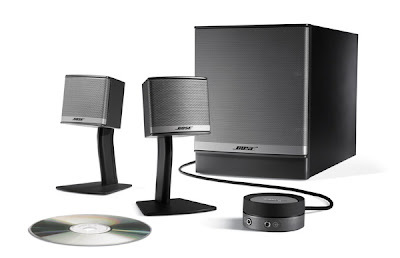 Today I purchased the Bose Companion 3 Speakers at the Bose Outlet at Cabezon, CA. I've been checking out this speaker for months. I couldn't decide between the lower model Companion 2 system (no subwoofer) @ $99 and the Companion 5 system @ $349.99. The good thing about the Bose Outlet store aside from the discounted price is that their demo station is side by side with the same music. I liked the Companion 2 speakers @ $99 but it's definitely sub-par to the 3 and 5 series. I found the Companion 5 is superb but maybe too much speakers for my need because if I really want superb quality sound to listen music and watch movies, I'll just turn on my home stereo system. The 5 series is perfect for those consumers who do no have a high quality home stereo system. That leaves the Companion 3 system which has low profile and footprint satellite speakers with a fantastic subwoofer for the low bass. It's like no other computer speakers I've ever heard. Just think the Companion 5 is even far better than the Companion 3 speakers. So, for those of you who do not have a home stereo system and want to listen to music or watch movies with your desktop computer, the Companion 5 system is the way to go. The Companion 3 and 5 system also features a remote volume control which also has a headphone jack and audio input jack for plugging in your mp3 player. I've been lurking like a vulture for a sale for months. The retail price which never goes on sale is $249.99. It's finally the 4th of July weekend sale with an additional 10% off of the outlet price of $219. It's $197.10 before tax. It's such a good deal, I just couldn't pass up this offer even though these are considered refurbished models. It still carries the 5 year Bose warranty. Go check it out this weekend before the sale is over.